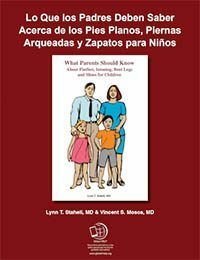 This publication is available in several formats, providing information for families about common developmental variations in infants and children. These variations include flatfeet, intoeing, and bent legs. Suggestions are provided in selecting the best shoes for children. We emphasize that these conditions are usually variations of normal and will resolve spontaneously without treatment. Edited by Lana Staheli. Cover by Pam Little. Spanish translation by Aurelio G. Martinez-Lozano.